I think the skies were a bit hazy as none of my photos have come out with the usual clarity (I hadn't even been drinking). The moon has always been a favourite of mine - capturing it and seeing it 'around the world' on 365 has been one of my favourite subjects. Forgive the double-upload, lots to do before the end of Wednesday...thank you for your comments, patience and just being there! Oops - thought I had double vision for a moment then!! :0) It is sooooo gorgeous isn't it! Great shot Phil. Always tricky to catch it with all the variable weather conditions. Nice ! We had high level clouds here too... I wanted to get a great shot but they all were a little fuzzy!! This is a great shot Phil! Lovely moon shot, Phil! A tip for you (if you don't mind), use your AV setting on your camera and zoom in all the way and see what happens (I checked online your camera model and saw it has an AV setting.). I checked your Exif info and the ISO is wicked high. It should be much lower (100 to 800). Just a bit of input if you want it. Either way - this is a very pretty moon shot. I'm glad you got the color. I have seen several shots with the color. I seem to not be going outside at the right time! One of these days I will remember! Awesome capture! It was overcast so I didn't have the opportunity to get a shot! 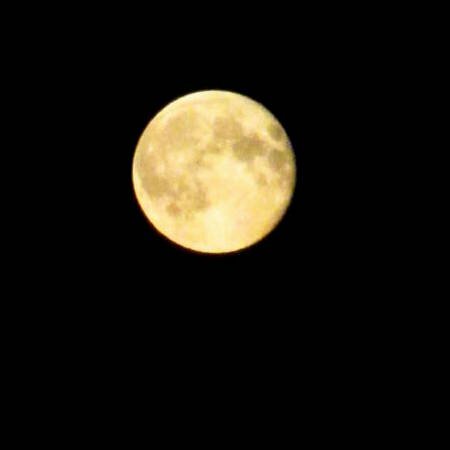 It was one amazing moon and thanks to my new camera I was finally able to get the coveted "moon shot"! Nice job on yours too!